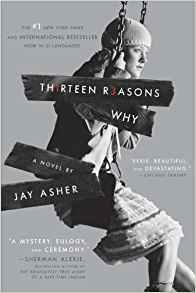 I recently read the brilliant Thirteen Reasons Why by Jay Asher. Wondering why it sounds familiar? It’s also been made into a TV series and is currently on its 2nd season with Netflix. It’s not a very long book, so it may not sound like much, but I finished it in an evening. Which I think says a lot about the story and the writing. I was hooked from the beginning. Genuinely. The reader is very quickly introduced to the main character and these 13 mysterious tapes. We are compelled into wanting to know more about each of the two stories running concurrently; Hannah’s on the tapes and Clay’s learning about each big moment in Hannah’s life that led to the last one. It’s so interesting because we are learning about a character who we care for and feel for but are only seeing the negative sides of her life. Meanwhile we start to get to know Clay, and support him on this journey, but all the time having our guard up, waiting to find out why he’s made it onto the list of people who have hurt Hannah. This story was fascinating. I’ve always loved YA (Young Adult) Fiction, and the fact that our characters are all teenagers is not lost on me. It’s a vulnerable time where young people are still learning a lot of wrongs and rights and regularly emotionally harm one another. As a teacher this story hit me hard. Hannah in many ways seems like any other teenager. Life throws terrible things at us all. Unkind words are spoken over everyone. But how deep does it go? How many times can it happen before it becomes too much? I regularly tell my students that they may think what they do or say is ‘funny’ or ‘banter’ but they can never know how it truly affects someone. Any otherwise minute thing can be a breaking point for anyone. Sometimes the signs aren’t there or the signs are missing. We can never truly know what’s going on in someone’s head. What this story does give us, unlike so many in real life, is all the steps in the story and an explanation. We get closure. And as painful as it is for Clay and everyone in the book, I think they get it too. They get to hear Hannah, hear her thoughts and views, reflect on their time together. Even though what they could have done differently haunts them for awhile at least they know why. Often that’s more than we get in the real World. This was a teary read for me, but 100% worth it. Although it is a story of fiction, it is based on so much fact through Jay Asher’s research for this book. I wish this was compulsory reading as I think it would open a lot of eyes, so I hope you choose to read it. I can’t vouch for how good the TV Series is, but if you’re not up for reading you can make it last longer and find out more about Jay Asher’s characters by watching the TV series.